For outdoor go karting in Nottingham ELK Racing is top of the list for us. 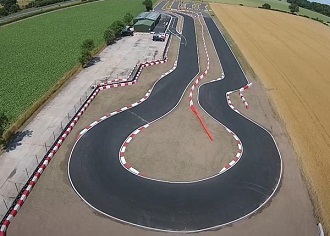 In previous years the layout of the track may have seemed a little like Buckmore Park, but with its new extension it becomes a different animal. We'd have to say that given the space available ELK have done a nice job and the track is also floodlit with good tarmac surfaces; ELK make their own karts too, so they know what they're doing. Arrive-and-drive, GPs and endurance event for large groups are all on offer and the friendly team will make you welcome. From the A1 follow the A46 for Licoln. At the Winthorpe roundabout (junction with A1133) turn right signposted toward the Showground. ELK is approximately 100m on the left. A chance for friends and their parents/guardians to drive at the same time on the same track. This event is not available during busy periods. There are conference facilities for 200.